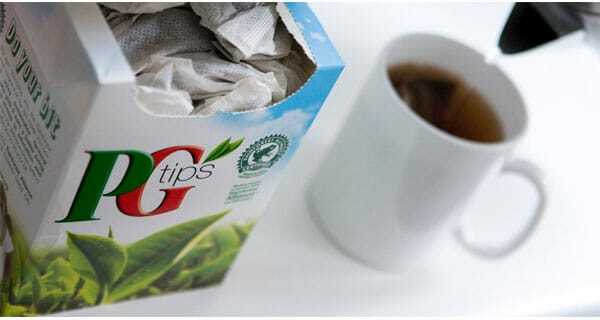 Unilever tea brand, PG tips, is launching tea bags that are 100% biodegradable: removing the plastic polypropylene which is commonly used as a sealant. The material in the tea bags is plant-based and 100% renewable and biodegradable. The first run of the tea bags has just hit UK shelves. Meanwhile the Co-op, a UK retailer, is also working to make its own-brand Fairtrade 99 tea bags free from polypropylene with the launch scheduled for later this year. The UK is one of the largest per capita tea drinking nations, consuming 156m cups a day or 60.2 billion per year. PG tips produce 10 billion tea bags a year. Its pyramid bags are currently made from around 80% compostable paper fibre with a ‘small amount’ of polypropylene in the remaining packaging to seal the bag, as is common across the industry. PG tips’ new tea bags use a material made from corn starch which is fully biodegradable. PG tips wants to see all its tea bags move to the new material by the end of the year. This means tea bags can be disposed of in food waste recycling or home composters. Some Unilever tea ranges in Canada, Poland and Indonesia have already been converted to plant-based alternatives. Noel Clarke, Vice President Refreshment, Unilever: “Tea is the most consumed beverage after water in the UK with 9 billion PG tips tea bags made every year and, after 85 years of making PG tips, we have a great understanding on how Brits love their tea. Mike Falconer Hall, Organics Programme Manager, WRAP: “We’re keen to see the UK’s tea drinkers recycle their tea bags and it’s great to hear that PG tips is helping them to do this with the introduction of their new fully biodegradable tea bag. Teapigs’s ‘tea temples’ and the string attached are made from cornstarch and are fully biodegradable, with the label made from paper and vegetable-based ink. Clipper Teas’ square heat-seal tea bags contain polypropylene: but it is running production trials to test an alternative solution. Its String & Tag bags do not contain polypropylene and are compostable. Tetley tea bags are 99% biodegradable but contain a ‘very small amount’ of plastic to ensure bags remain closed. Pukka tea bags – bought by Unilever last year – are stitched closed without the use of plastic and are compostable and biodegradable.